The Charter for the Society of Artists of Great Britain and its associated Roll of Obligation have been rediscovered at the Royal Academy of Arts, 250 years after was society was founded. The documents, long thought to have been missing, date from 1765 and signify the formation of artists as a professional group in Britain. They form a crucial piece in history of the development of the Royal Academy of Arts, which formed in 1768 when a group of artists broke away from the society. The Charter, which consists of three pages of vellum with a portrait of a young King George III, hadn’t been seen since 1918. It and the Roll of Obligation – which features the crossed-out names of artists ‘expelled’ from the society, including the RA’s first president, artist Joshua Reynolds and German-born Johann Zoffany – were rediscovered earlier this year during an audit of the RA collections. 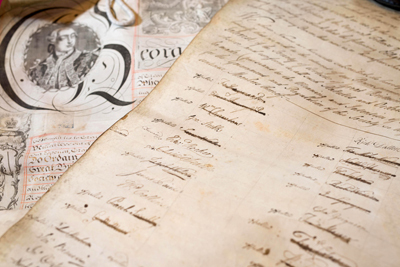 The finding coincides with the 250th anniversary of the formal foundation of the society when it was granted a Royal Charter by King George III. Both documents will go on show from 2018 – the 250th anniversary of the founding of the RA – in new exhibition areas being created as part of the transformation taking place at the RA. For more on the Royal Academy, see www.royalacademy.org.uk. What a wonderful find! But where did the 1765 Society of Artists’ charter go, after WW1? Since the Royal Academy of Arts war formed only 3 years later (in 1768) when a group of artists broke away from the society or were expelled, something went awry at the beginning of the profession’s organisational work.